Own "The Full Rah" by Gene Hoglan. With an extraordinary color palette of green, magenta, yellow, purple, navajo blue, and cyan, The Full Rah is a unique and fluid visual exploration of rhythm. Gene utilized much of the drumkit to produce the work's electrified aesthetic. 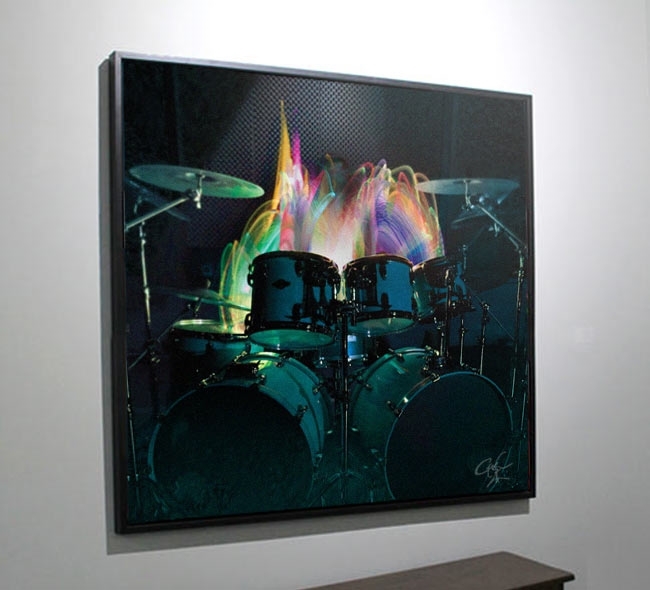 To provide context, the sound proof wall and a clear shot of the drumkit are visible in the work. Measuring 30"x 30" on canvas, there are a total of 35 pieces in the edition. All are numbered and individually signed by Gene Hoglan. All ship with SceneFour Authenticity Certificates.